The immune system is a complex array of cells that are found throughout the body. Immune cells are designed to work in conjunction with other cells to provide a defense against unwanted invaders. The complexity of the immune system requires a multidimensional approach of nutritional factors. 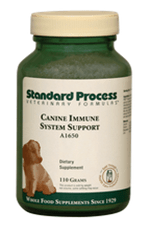 The nutritional support of the immune system is directed at facilitating normal function and is not intended to be suppressive or stimulating. Bovine liver, nutritional yeast, bovine and ovine spleen, rice bran, bovine spleen PMG™ extract, bovine thymus PMG™ extract, carrot, bovine kidney, bovine thymus Cytosol™ extract, buckwheat leaf juice and seed, bovine pancreas Cytosol™ extract, pea vine juice, Eleutherococcus senticosus, porcine duodenum, black currant juice, porcine jejunum, bovine adrenal Cytosol™ extract, veal bone PMG™ extract, oat flour, calcium lactate, purified bovine bile salts, defatted wheat germ, mushroom, Spanish black radish, ribonucleic acid, bovine adrenal PMG™ extract, Tillandsia usneoides, Withania somnifera, zinc rice chelate, kelp, and black currant seed oil.